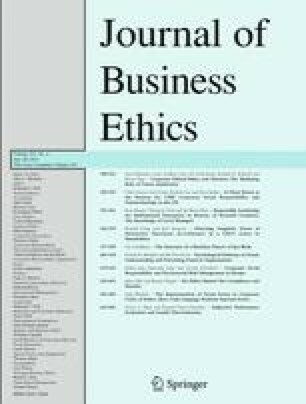 This study explores the ability of career satisfaction to mediate the relationship between corporate ethical values and altruism. Using a sample of individuals employed in a four-campus, regional health science center, it was determined that individual career satisfaction fully mediated the positive relationship between perceptions of corporate ethical values and self-reported altruism. The findings imply that companies dedicating attention to positive corporate ethical values can enhance employee attitudes and altruistic behaviors, especially when individuals experience a high degree of career satisfaction. This study was presented at the 2007 Academy of Management Meeting, Philadelphia, PA.
1.Department of ManagementUniversity of North DakotaGrand ForksU.S.A. 2.Department of Management and MarketingLamar UniversityBeaumontU.S.A. 3.Department of AccountingUniversity of WyomingLaramieU.S.A. 4.Department of Management and MarketingUniversity of WyomingLaramieU.S.A. 5.Navitas Pharma, Inc.Navitas Assets, LLCLaramieU.S.A.